Tomatoes. Because they are my favorite food. Home grown ones, preferable grown by the Mingo, because he grows the most fantastically mouthgasm tomatoes in the universe. 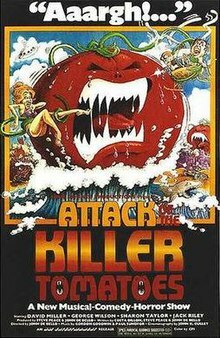 I also think there could be tomato inspired songs and images and poems and stories, tomato super hero outfits, tomato jewelry, and tomato imaginary friends, culminating in a showing of Attack of the Killer Tomatoes. Yes. I wonder, L.Y., do you like all types of gazpacho? I do.